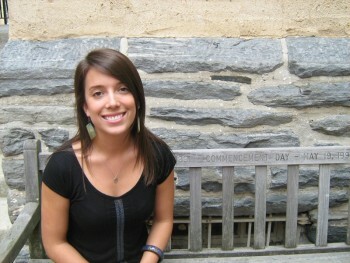 Juliana Morgan-Trostle '12 will go to Argentina next year on a Fulbright grant. The political science major will spend her first post-graduate year studying marriage- and reproductive-rights policy in Argentina. Juliana Morgan-Trostle '12 has had a longstanding love affair with Argentina. The daughter of two professors from Amherst, Massachusetts, she first went there during her parents' sabbatical year when she was 16, the only American student in her Spanish-speaking high school. She returned with the Haverford Field Hockey Team the summer after her freshman year. And, most recently, she studied abroad in Buenos Aires last spring. Following her Haverford graduation, Morgan-Trostle will be returning to the country she so loves as the recipient of a U.S. Student Fulbright Award. The grant will allow the political science major, Spanish minor and a Latin American Studies concentrator to continue the research she began during her semester abroad. On her last trip to Argentina, she conducted research into why it was the first South American country to legalize gay marriage, but still criminalized abortion. Morgan-Trostle will continue this research when she returns to South America's second largest country in February (because Argentina is in the Southern Hemisphere, its school year doesn't start until then, during its late summer). She hopes to interview legislators and do analyses of three major newspapers to see how these issues have been interpreted. She will be working under both Juan Marco Vaggione at the Center for Social and Judicial Investigation of the National University of CÃ³rdoba and Silvina Ramos at the Center for the Study of State and Society (CEDES) in Buenos Aires, most likely splitting her time between the two cities. in the future, Morgan-Trostle hopes to get a master's degree in public policy and pursue a law degree with a focus on international human rights, and reproductive rights in particular. â€œReproductive rights is what I've been really passionate about during my time at Haverford,” says Morgan-Trostle, who started a club called Vox (Voices for Planned Parenthood) and has worked with the Student Health Advisory Committee to distribute condoms on campus. She credits her time at the College with nurturing her interests, helping her earn her Fulbright and giving her the tools to be successful in her upcoming research project in Argentina. â€œAnita Isaacs, who is my advisor, has been enormously helpful,” she says.“She hired me as a research assistant the summer after my sophomore year to go to Guatemala, and I learned so much from her about how to interview, how to conduct primary research.